In our modern world, we have become so dependent on electricity that we find it very difficult to cope without it. Finding creative ways to deal with power outages, however, can mean the difference between living comfortably through times with no lights and going hungry. If you are one of the more than 75% of Americans with an outdoor grill then you are already on the road to success. A gas or even charcoal grill can do many things for you during these times. But remember the one thing a grill definitely can not do is heat your home. Don't even think about it trying it. Outdoor grills must stay outdoors. Of course, this seems pretty obvious and if you know the very basics of grilling you shouldn't have a moment's trouble. However, people don't often think of a backyard grill as a backup cooking appliance for when others are unavailable. Because of this most people will make some basic mistakes. I've compiled the following list of rules and tips to help keep things safe since some mistakes can be very deadly. Outdoor cooking equipment must stay out-of-doors. Never bring a gas or charcoal grill inside of your house or use it in an enclosed space. These units can create a great deal of carbon monoxide which is undoubtedly unsafe. Every year dozens of people die from carbon monoxide poisoning while using a grill indoors or in an enclosed space. Always make sure you have enough fuel. For the typical gas grill, a full propane tank will give you enough fuel to cook about 30 to 50 meals. One full tank will keep you grilling three meals a day for at least 10 days. Sounds good, but how much propane do you have in your tank right now? Not sure, don't bet on there being enough. It is always a good idea to have a spare full tank at all times. The tank you fill is not the one you need, it's the spare. Store your spare tank in a protected but not enclosed place, especially not in your house. As for charcoal, a 20-pound bag of briquettes should get you through at least 4 to 6 cookouts. If you are betting on using a charcoal grill in an emergency situation, make sure you have at least two 20 pound bags. Have the right cooking tools and equipment on hand. Sure, you can always throw some burgers or chicken on the grill when the lights go out, but how about boiling water? Many of the pots and pans we use today have wooden or plastic parts that will burn or melt if placed inside a grill. If you have a gas grill with a side burner then you are fine and should use the side burner as much as possible. A 12,000 BTU side burner is going to use a lot less gas than turning on all the burners in your 40,000 BTU gas grill. You can place most pots and pans on the side burner to boil water or heat up a can of soup, but if you don't have a side burner then you will need to place pots and pans ​inside the grill. Having at least one large saucepan and one skillet that can be used on a grill will give you all the versatility you need to prepare almost anything. If you have camp cooking equipment this is perfect. Also, remember that in some emergencies it might be necessary to boil all the water you drink. This will require a large pot and plenty of fuel. If you don't know how long you are going to be in the dark, conserve early. Don't burn up fuel and food ​on the first day if you are unable to replenish your supplies for several days. Use fuel sparingly by not preheating for more than five minutes and make sure you turn off the gas before you are done. 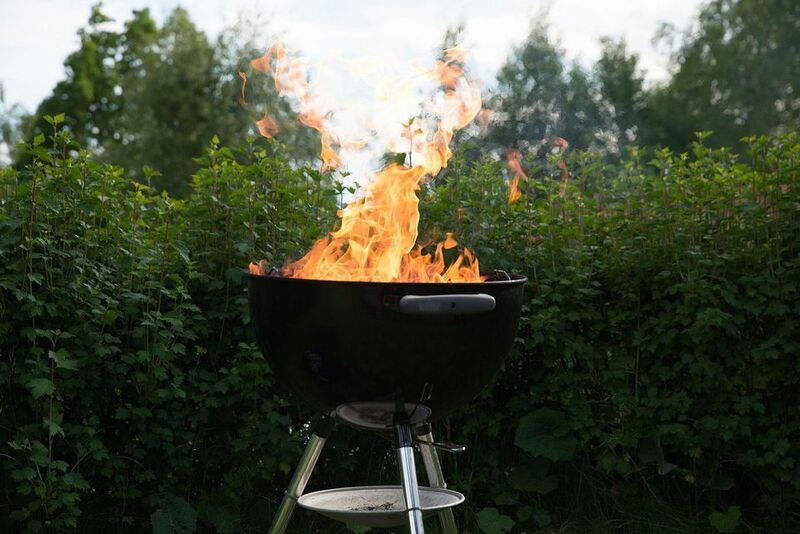 Gas grills maintain heat for a few minutes after the fire goes out. Use this time to finish up. When using charcoal, light only as much as you need. You can add coals a few at a time if you need more heat or if you need to cook for a longer time. Also, plan on heating everything you might need all at once. Most grills have large cooking areas so you can have a pot of two of water going while you cook other dishes. But make sure that you maintain a high level of food safety. Be sure that everything which comes in contact with raw meat is heated to at least 165 F.
Meats in the refrigerator will go bad before vegetables or frozen foods. These things should be the first foods you cook. Cooked meats stay good longer than raw meats. It is also good to remember to keep ​your refrigerator closed as much as possible. Think before you open. Get what you need as quickly as possible and close the door. Practice barbecue safety as though it were a religion. If the power is out, if you are trapped at home, if basic services are not available, you may not be able to get proper treatment for burns and other injuries. This is not the time to do something stupid that would normally win you a costly trip to the emergency room. While you don't ever want to get burned or injured while cooking out, when the power has failed you particularly don't want to put your life in the hands of what might be an already exhausted medical system. Think first, grill later. While gas grills are easier to use and generally more convenient, charcoal grills do have the advantage of retaining heat from smoldering coals for several hours depending on the conditions. Wind will be your worse enemy. This gives you the ability to use your charcoal grill to keep foods warm for several hours. You can grill up lunch while you grill dinner. Wrap the foods you'll want to eat later tightly in aluminum foil and set them around the sides of your charcoal grill. Replace the lid and close down the vents. This will keep the fire warm, but not hot for several hours. You may also open up the vents, add more coals and quickly be back to grilling. The basic rules are to keep your head. Think about what you need to do and take it very carefully. Conserve fuel and heat so you will be able to grill your way through most any disaster. But don’t let your house fire become the next disaster. Be safe, be careful and eat well. Also remember those around you who might not be so lucky as to have a backyard grill. They might not have the equipment, but they might have some good steaks in the refrigerator that you’ll just have to get cooked up quickly.